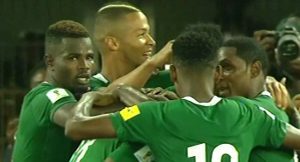 Arsenal midfielder, Alex Iwobi proved himself a super substitute for Nigeria on Saturday when he scored the decisive goal needed to take the African football giant to the Russian World Cup. Nigeria needed a victory, no matter the margin, against visitors Chipolopolo of Zambia and Iwobi made the 1-0 victory possible. Iwobi came in the 67th minute and seven minutes after, he utilised a cross by a team mate after a pass by Victor Moses to score for Nigeria’s Super Eagles, thus dashing Zambia’s hopes of upsetting the Eagles. Nigeria now have 13 points in Group B, followed by Zambia with 7 points. Cameroon have six points. Nigeria’s final match in November against Algeria will now be a mere formality as Iwobi’s goal has booked a place for the Super Eagles next year in Russia. Nigeria have now become the first African side to book their place at 2018 FIFA World Cup Russia. It would be the Eagles sixth appearance at the FIFA World Cup.